Happy release day, Doorways to Extra Time! It’s finally here! 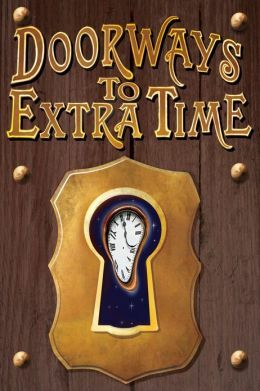 Happy book birthday to Doorways for Extra Time! If you already preordered it, THANK YOU! If you haven’t, the wait is over! Buy it now and download the ebook or have the paperback shipped to you ASAP. This is what it must be like to have your life flash before your eyes. Everyone I’ve ever met exists here, and their faces and words pass me by in an instant. But then I begin to see places I’ve never been, people I’ve never seen, and hear words I don’t understand. Trying to focus on it all at once increases the pressure in my head until I worry my brain might explode out my ears, so I relax and let it pass me by, concentrating only on the moment I want to find. Everything blurs past faster and faster, and I feel like I’m falling. I think my eyes are open, but everything is black. Want to look back at the other snippets? Links, then! This entry was posted in Blog, Books, Doorways to Extra Time, Giveaways, News, Spencer Hill Press, The Dream War Saga, Whatever It Takes on August 27, 2013 by Erica Cameron. Counting down to release day! 1 day! I light the candles and the incense, meditate while chanting foreign-sounding words, and lie down on my bed, concentrating on the exact time I want to go back to. I pour all my energy into that thought and the image of a clock stuck at exactly 10:05 PM on Friday, October 19th. Keeping that image in my head, I close my eyes and focus. Time isn’t a line or a circle or any 2-D object, Aisling had written. It’s more like you’re standing inside of a sphere of constantly flowing energy. When you find that center, you can reach out and touch any part of your life. I imagine a ball of bluish-white light. I concentrate solely on that image and hold it in my mind. I do nothing but concentrate. I wake up the next morning in exactly the same position. Tomorrow details will go up about my giveaway, but there’s still time to enter to win one of five copies on Goodreads! The Dragon Con launch party is a go, but unfortunately I won’t be there. Travel arrangements and a place to sleep kind of fell apart. It would have been fun, though! And I know some of my fellow contributors will be there. Track them down if you can! The updates to thedreamwarsaga.com go up this weekend with a playlist for Sing Sweet Nightingale and character bios from “Whatever it Takes” and I can’t wait until people get to read the book! So exciting! This entry was posted in Blog, Books, Doorways to Extra Time, Giveaways, Spencer Hill Press, The Dream War Saga, Whatever It Takes on August 26, 2013 by Erica Cameron. Counting down to release day! 6 days! Today, I’m jumping right in to the fun stuff. Snippet number four! Oh the tricks of time travel! Will Valari be able to make it work? And if she does, will it solve her problems or leave her with more of them? My first giveaway on my site will happen next week, so make sure you come back to celebrate the release with me! Also, don’t forget to check thedreamwarsaga.com later this month for the first extras from the series including a playlist for Sing Sweet Nightingale and character bios from “Whatever it Takes”! This entry was posted in Blog, Books, Doorways to Extra Time, Giveaways, Spencer Hill Press, The Dream War Saga, Whatever It Takes on August 21, 2013 by Erica Cameron. Counting down to release day! 8 days! Just over a week from now, you’ll be able to get a copy of Doorways to Extra Time! In case you haven’t preordered (and even if you have), enter to win one of five copies on Goodreads! Also, don’t forget to check thedreamwarsaga.com later this month for the first extras from the series including a playlist for Sing Sweet Nightingale and character bios from “Whatever it Takes”! Sometimes dead ends can lead you exactly where you need to go! Will that be the case for my dear Valari, though? This entry was posted in Blog, Books, Doorways to Extra Time, Giveaways, The Dream War Saga, Whatever It Takes on August 19, 2013 by Erica Cameron. Guys, for the first time EVER, I held a real book with my name in it somewhere. Words I wrote! In my name! SEE THAT?! My story is second! SECOND! I mean, fourth if you count the two introductions, but still! That’s pretty good placement. Also, I’d like to direct your attention to the page numbers. Yes, I did manage to write a 21 page story and still slap the label “short” on it. According to the word counts for the Hugo Award, “Whatever It Takes” technically qualifies as a novelette. But for the purposes of the anthology, we’re still going to call it a short story. Only 11 days until people will have their own copies of Doorways to Extra Time! Until then, I’m going to hug mine and pet the cover and flip through the pages about a million times. This entry was posted in Blog, Books, Doorways to Extra Time, News, Personal, Pictures, Publication, Spencer Hill Press, The Dream War Saga, Whatever It Takes on August 16, 2013 by Erica Cameron. Counting down to release day! 11 days! Getting closer and closer, everyone! Only 11 days left until Doorways to Extra Time releases and, with it, my story “Whatever it Takes“! Details are still in the works for my personal giveaway program, but… soon! Don’t forget, though, there’s still time to enter to win one of five copies on Goodreads! Also in the works, a possible appearance at Dragon Con later this month, which would be more than a little epic. I’ll let you know once I’m 100% positive I’m going to be there. Today I’m posting another peek at “Whatever It Takes” and there are still four more to come! These posts will also be cross-posted on thedreamwarsaga.com where, later this month, you’ll be able to find a list of songs that remind me of Sing Sweet Nightingale as well as the character bios I mentioned on Wednesday! This entry was posted in Blog, Books, Doorways to Extra Time, Giveaways, News, Spencer Hill Press, The Dream War Saga, Whatever It Takes on August 16, 2013 by Erica Cameron. Counting down to release day! 13 days! My short story “Whatever It Takes” releases in 13 days! That’s when the anthology, Doorways to Extra Time, will be available to the big, wide world. August 27th is coming up fast and so is the start of my monthly giveaways! I’ll be giving away one copy of the Doorways anthology every month between now and December. Details are still forthcoming, but it will happen soon! Until then, you can enter to win one of five copies on Goodreads! To celebrate the ever-nearing release, I’ll be posting short snippets of my story here. Six total before release day! And, yes, my story is long enough to pull six snippets from without spoiling anything! At the end of the month, I’ll also activate the first character bios on thedreamwarsaga.com, the four named characters from “Whatever it Takes.” From there, we’ll be getting closer and closer to the release of Sing Sweet Nightingale and your first really deep dive into my dreamworld. For now, though, without further ado, here is snippet number one! So excited to share this story with everyone! And even more excited to see this book release. That means we’re one step closer to celebrating Sing Sweet Nightingale! This entry was posted in Blog, Books, Doorways to Extra Time, Giveaways, Publication, The Dream War Saga, Whatever It Takes on August 14, 2013 by Erica Cameron. My short story Whatever It Takes is in this anthology. The story is set within the world of The Dream War Saga, but only tangentially connects to the series itself. A good peek into the Dream War universe, Whatever It Takes is available for pre-order now! Everyone wishes they could get an extra hour in the day. But what if you could? What if you had a special device that gave you an extra day every week? You could use it to get ahead at work… unless your boss had it too. What if you knew a spell that gave you an extra hour every day? You could use it to correct a mistake… or make a new one. What if you could just stop time? You could accomplish a myriad of wonders… if you only knew how to get time started again. Time loops and time travel, time apps and time outs, time machines, time merchants, and more can be found passing through these doorways into worlds where time can be spent like money… or where extra time can only be bought at a terrible price. We’d have to deal with the consequences. This entry was posted in Blog, Book Covers, Doorways to Extra Time, News, Spencer Hill Press, The Dream War Saga, Whatever It Takes on June 3, 2013 by Erica Cameron.